WASHINGTON D.C. (Bloomberg) -- Toyota Motor Corp., the world’s biggest automaker, settled a patent-infringement dispute that had threatened U.S. imports of its newest hybrid vehicles, including the Prius. The agreement with Paice LLC, ending six years of litigation, was announced Monday as a hearing was to begin on a claim against Toyota before the U.S. International Trade Commission in Washington. Terms weren’t disclosed and lawsuits pending in Texas and at a U.S. appeals court will be dismissed. Paice founder Alex Severinsky, a Soviet emigrant who began his career developing antitank-warfare instrumentation, had said his 1994 patented system for a high-voltage method to power gasoline-electric hybrid cars was used by Toyota without permission. Severinsky, 65, has sought royalties from the automaker. Ford Motor Co., maker of the Fusion hybrid car, agreed to license Paice’s technology, the companies said on July 16 without revealing terms. The Paice patent covers a way to supply torque to a car’s wheels from both an electric motor and internal combustion engine using a combination of high voltage and low current. Toyota, which was found to have infringed the patent in an earlier case, had said its hybrid vehicles are the result of its own research and asked the trade commission to deny Severinsky’s latest claims. “The parties agree that, although certain Toyota vehicles have been found to be equivalent to a Paice patent, Toyota invented, designed and developed the Prius and Toyota’s hybrid technology independent of any inventions of Dr. Severinsky and Paice as part of Toyota’s long history of innovation,” both companies said in separate statements. The ITC is an independent agency set up to protect U.S. markets from unfair trade practices. When a violation is found, it has the power to block imports of products and typically sides with patent owners unless there are health or public-policy issues. The issue in the trial that was to begin Monday hinged on what is more important: Severinsky’s right to protect the millions of dollars invested in his invention or the potential economic harm of banning Toyota’s hybrid-vehicle imports. ITC Judge Theodore R. Essex had said Toyota couldn’t try to reargue the validity of the patent or whether it’s infringed, leaving open the question of whether Paice has a domestic market to protect, and if it was in the public interest to issue a ban. Citing potential job losses, lawmakers wrote the ITC to side with Toyota. Among them were Senate Republican Leader Mitch McConnell of Kentucky, who has a Toyota plant in his state that makes hybrid vehicles, and Democratic Representative Travis Childers of Mississippi, where Toyota is building a factory. 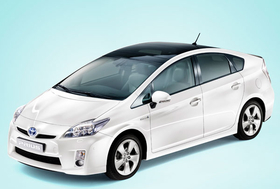 Toyota is the biggest seller of hybrid vehicles in the United States. In June, the company sold 14,639 hybrids in the U.S., including 1,933 Lexus hybrids, about 10 percent of its total sales. The ITC’s case related to the company’s current, third-generation Prius as well as the Camry hybrid, Lexus HS250h and Lexus RX450h. Toyota was found in a 2005 trial to have infringed Severinsky’s patent on torque technology used in earlier versions of the Prius, Lexus RX400h and hybrid Toyota Highlanders. A federal jury awarded $4.27 million to the company Severinsky founded, Bonita Springs, Florida,-based Paice. The judge declined to halt sales of the hybrids, and instead told the automaker to pay Paice $25 for every car. He later raised the amount to about $98 after an appeals court ordered a recalculation. Toyota appealed that decision. If the $98 rate were applied to all of Toyota’s hybrids now on sale in the U.S., the company would have to pay $1.43 million in royalties for June alone. The company reported fourth-quarter net income of 112 billion yen ($1.27 billion) on May 11. Paice Chairman Frances M. Keenan, vice president of finance at Baltimore’s Abell Foundation that has invested $20 million in Paice since 1998, declined to say if the company is talking to additional automakers about licensing the Paice patent.